PLEASE Read These Policies Thoroughly. Our goal is to maximize our guests’ enjoyment by maintaining a fun, picturesque, quiet, safe and clean environment for all of our customers vacationing at our cabin rental resort in Arizona. We ask everyone to read and understand our policies before making your rental cabin reservation, just so you don’t have any unpleasant surprises. Most folks get a chuckle out of how simple some of this stuff is, but we need to say it anyway. Check-in time is 3PM. Checkout time is 11AM. Pre-approved early check-ins and/or late check-outs will be billed by the quarter hour based on the hourly room rate break down for the agreed upon rental rate stated above. Unapproved late checkouts are billed at $50 per hour. Guests are responsible for any damage to their cabin(s) or the resort grounds. As the general rule of thumb, we expect the cabins and the grounds to be left the way they were when you arrived with the exception of a general housekeeping service. Smoking is ONLY permitted on front porch of cabins. Smokers must dispose of cigarette butts in ash can located at base of front porch stairs. $100 minimum cleaning fee for smoking in a cabin. If you smoke in the cabin there will be a charge. 2 Vehicles (including trailers) maximum per cabin. Additional vehicles can park in overflow parking areas away from the cabins. You must notify us when reserving if you need space for more than two vehicles. No operation of ATC/Quads/Dirt Bikes on resort property. You can drive in and out (if your street legal) while heading to and from the trails, but recreational riding is prohibited. Our facilities are for registered guests and approved visitors only so that we can maintain the safety and security of our resort. Unapproved visitors are NOT allowed at any time. For each unreported guest you will be billed $50 per day. Only registered dogs are allowed on property. Unregistered dogs\pets will be billed at $50 per animal per day. Linens\Towels can be exchanged for clean replacements every 3 days. If you really need fresh towels and sheets every day, we will provide them for you for $25 per day. A $50 minimum cleanup fee for any cabin that is excessively dirty (including dirty dishes). If our staff must wash or re-wash your dishes there will be a minimum fee of $50. 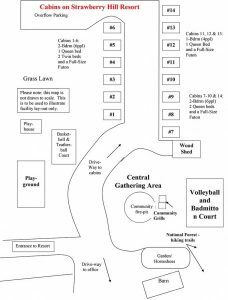 Gathering area and campfire pit is open to all guests unless fire restrictions are in place. Please clean up after yourself, throw away your trash, brush and clean the grill after you use it and do not throw bottles or cans into the campfire or marsh mellows around the campfire area. Please respect our property and our other guests. The horseshoe pit area is available for our guests’ enjoyment. However, the use of the pit is intended for adults 18 years of age and older. No minors are allowed in the horseshoe pit area unless accompanied by a parent or legal guardian. Guests play at their own risk. DO NOT BREAK THE BRANCHES OFF OUR TREES FOR ANY REASON. If you need sticks for roasting marshmallows or hot dogs, they are located in the kitchen cupboard of every cabin. Our trees are very costly and we happen to like them the way they are. Do not damage them. Replacing a damaged tree can cost hundreds of dollars, so please, just don’t do it. Charcoal grills are for charcoal use only. No campfires or any use of wood or paper allowed in the charcoal grills near cabins (this is an obvious fire hazard). Firewood is for use on property only. Taking wood from the resort is considered theft and will be prosecuted. A $50 minimum cleanup fee for dog feces, graffiti, cigarette butts, confetti, streamers, silly string, balloons, airsoft pellets (BB’s), bottle caps or other items improperly disposed of. The woodstove doors must remain closed when a fire is burning. Guests are fully responsible for any damage or carpet burns and will be charged for carpet repairs or replacement. A $50 minimum lost/non-returned key charge. A fee of $25 will be billed to your credit card on file for missing or damaged in-room information guidebook. No refund for guest(s) evicted from resort. Wi-Fi access may be limited due to weather or service interruptions and is not guaranteed. Reservations for our Spa Services (massages, facials, waxing, etc.) are non-cancellable within 48 hours of the scheduled appointment time. Charges for spa services will automatically be charged to the customer’s credit card on file. We legally reserve the right to refuse service to anyone. Rates/Policies are subject to change without prior notification. Note: It is not our intention to charge additional fees if our property is left in a reasonable manner that displays respect to the resort grounds, individual cabin belongings, the cabin structure and other resort guests. The frequency of such occurrences is extremely rare. RESERVATIONS and DEPOSITS:All reservations require a deposit of 50% of the reservation total at the time the cabin(s) is reserved. This guarantees that the cabin(s) is held for you. The remaining balance will be charged to the same card the morning of your arrival. Visa, MasterCard, Amex, Discover and cash are accepted. ALL customers are required to provide a valid state-issued driver’s license (or ID card) AND credit card upon check-in. If you don’t have a credit card, a $300 (cash) refundable Security and Cleanliness Deposit is required. If you don’t have a state-issued ID, we can’t rent you a cabin. Sorry. CANCELLATION POLICY:Reservations that are cancelled prior to the cancellation period will receive a full refund less a $25 (per cabin) cancellation fee. If cancellation occurs within the cancellation period, the reservation total is due immediately and remaining balance will be charged to the customer’s credit card on file. Refund of charges is subject to cabin re-rental. If we are able to resell the cabin we will refund the total charges less a $25 (per cabin) cancellation fee. Also, if we are able to re-rent the cabin for only part of your scheduled reservation, only those nights are subject to refund. Cancellation Periods vary depending on the type of reservation: duration, holidays, large groups, etc. 1 cabin reserved = 14 DAY cancellation period. 1 cabin reserved for 7 days or more OR during a holiday period = 30 DAY cancellation period. Holiday periods include New Years, Memorial Day, 1st week of July, Labor Day, Thanksgiving and Christmas. Please contact resort management for specific dates considered to be within a holiday period before making reservation.